What can you do when you hear that asylum seekers have come to the old prison in your town and besides their worries they are also bored? You gather old chess sets from everywhere and you ask your chess club members to donate a new chessboard. That is what happened to Niels van der Mark in Doetinchem in the Netherlands a year ago. Now, one year later they play weekly in the centre and meet a lot of refugees. Most of the time they exchange only a few words of English. But they play chess the whole afternoon, shake hands and sometimes hug and that’s good. The refugees that come to Doetinchem, a small town near the German border and stay there for about 6-8 weeks. During they stay they learn whether they can stay (most of the time for 5 years) or have to leave. Although they know they know they can stay safely for period of when they come from the civil war in Syria, they are naturally worried about the process. Somehow playing a game of chess eases there mind. It provides a distraction from thinking about their relatives who may also be on the run if they haven’t managed to escape from Syria. On the chessboard they are solving other problems on the chessboard that they have a chance to solve. 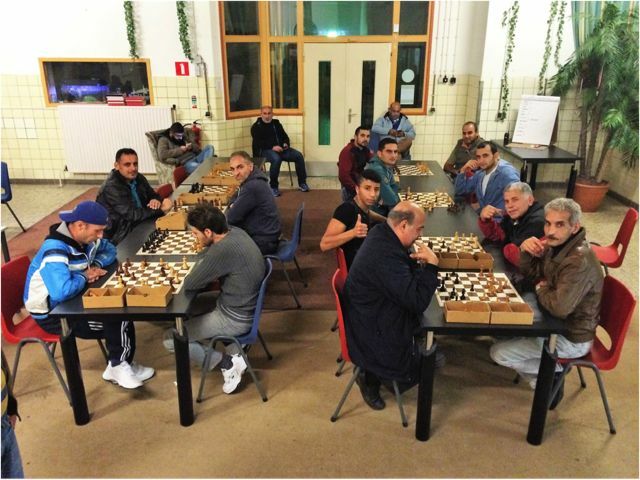 During their stay in Doetinchem, the club offers asylum seekers free membership. The club is one way to help them to get into Dutch culture and customs. 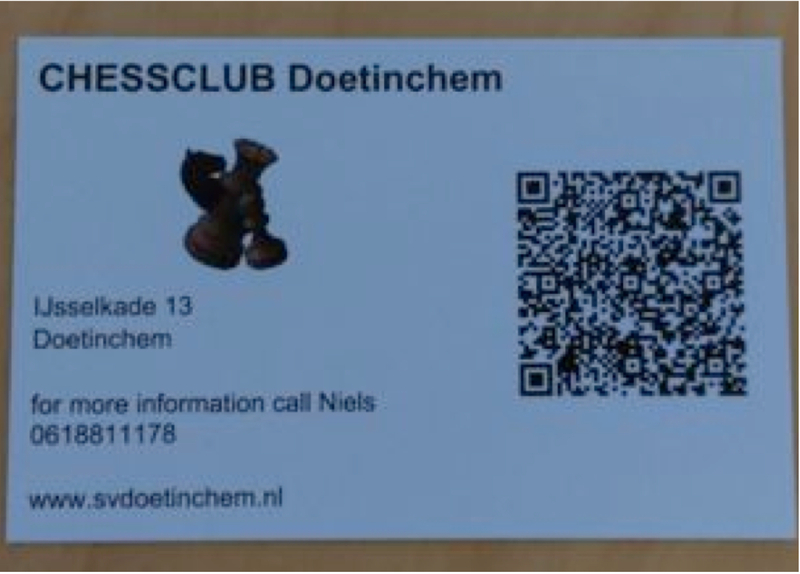 The club made a business card with its address and a QR-code they can scan which opens Google Maps and the route to the playing location. The card is issued if they would like to play a serious game of chess. Another way they have found to stay in touch is through Chess.com. Niels invites the asylum seekers to create an account so they can play online once they have left for another centre for. 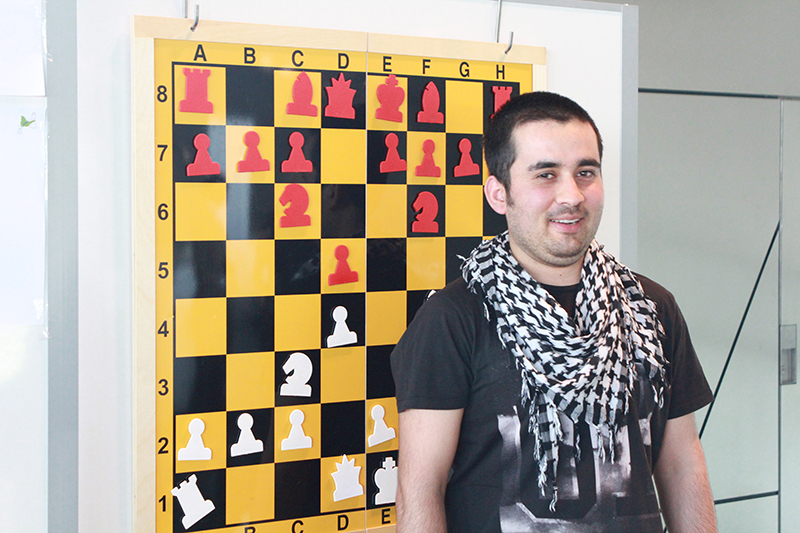 Besides playing chess they can still stay in touch.In this way, Niels kept in touch with Mohammed and learned that he wanted to start a chess club in the centre where he was staying. Niels organised ten boards and pieces and brought it to him. And so he started a chess club in the centre at Deventer. Niels Van Der Mark will be speaking about his project at the conference. Fernando Moreno is a school counselor based in Maryland near Washington DC, the US capital. He has for over a decade been developing chess as an instrument of psychological counseling. His approach focuses on improving the social and emotional skills of his students and consequently their academic performance. For new migrants, he supports their adaptation and integration by increasing the involvement of the family in their new school. His innovative technique is to present real life situations as carefully chosen chess positions. The chess position models in some way the decisions that they have to make. The children that Fernando supports did not start life with many prospects. His school has the lowest income population in the district with 95% of the pupils receiving free school meals. Furthermore, three quarters have limited knowledge of English. Many of them received little schooling in their home country before immigrating. The families may have experienced war, poverty, violence or persecution. Chess does not have any bounds: it is played in every country. Fernando relates to the newcomers by telling them about chess in their culture. He tells stories of the players and refers to a chess library illustrating games from Central America (El Salvador, Mexico), South America (Colombia, Peru, Bolivia), Asia (China, Vietnam), Africa (Nigeria, Kenya, South Africa), Spain and Russia. Fernando tells the newcomers that their move was not a free choice but was due to external circumstances. He correlates this narrative with chess: if you learn the rules of the game then you can move your own pieces according to one’s own plan. He teaches the children the new rules of the environment, how to take appropriate measures to improve and feel better at the new school, and how to get on with their new teammates. Chess with Fernando is a noisy, boisterous affair. Playing and talking at the same time gets across his messages more powerfully. The key to the therapeutic effectiveness is a synchronously shared experience. He can sense the feelings and thoughts of his students and this creates a positive atmosphere of trust. They talk through the student’s decisions about their life situation. Fernando recommends using a large floor standing chess board because this results in more insightful conversations, perhaps because body language is more evident. This is pioneering work and some may question whether it is possible to replicate Fernando’s therapeutic approach because it depends so much on his interpersonal skills. However, he points out that it is not necessary to be a strong chess player – only to play at the same level as the pupils. It is even a bonus if the pupils can beat him sometimes. He can explore decision making in circumstances of inexperience and ignorance. They learn together to find the best chess moves as they might do in real life. Fernando will be presenting his approach at the conference. Top diagram: Fernando is introducing parents to chess.